Welcome to my website, I hope you enjoy looking around. 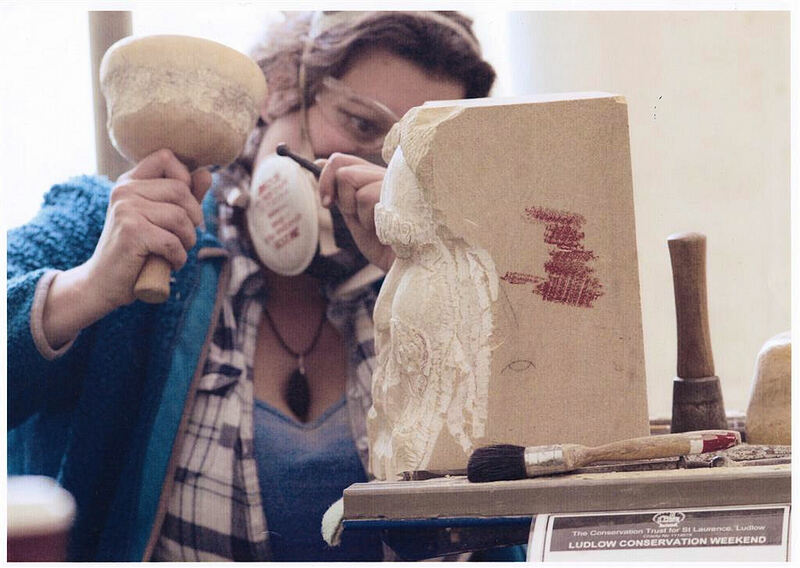 In 1995 I started my degree in sculpture which focused on portrait and figurative sculpture, in the Summer of 1999 I completed my degree and moved to Gloucestershire to carry out an apprenticeship in stonemasonry at Gloucester Cathedral. In 2002 I completed my apprenticeship and I spent the following 3yrs working with 2 different companies in Gloucestershire, where I designed and carved a wide selection of architectural stonemasonry and memorials. In November 2005 I set up my own business which derives it’s name from my stonemason mark-the Cat’s Eye. Over the last 12 yrs of running my own business I have developed my skills in order to design and carve beautiful sculptures, exact copy portraits of both animals and people and a variety of letter cutting using calligraphy styles, I have also developed my own style which can be developed for a specific commission or to compliment a carved word or sound. Hand carved stone house signs are a speciality and I can personalise them with an image of your choosing, colour of paint or gold leaf and obviously a wide variety of locally sourced stone. You will find me almost everyday in my workshop which is located at Taurus Crafts on the A48 at the edge of the Forest of Dean. I am always carving something, a new commission, some new carvings to buy off the shelf from my shop or one of my more sculptural pieces. I have also started to create casts of some of my clay models and plaster carvings in order to offer a less expensive range of my own unique designs, these are cast using a weatherproof material. For my carvings I use Limestone from Portland in Dorset, Tetbury in South Gloucestershire, Bath in Somerset and Caen in Normandy. Slate from the Horseshoe Pass in North Wales and Delabole in North Cornwall. Sandstone from St Bees in Cumbria and various quarries around The Forest of Dean. I have a shop at the front of my workshop and you can find a wide selection of carvings and small gifts for sale, from The Green Man, beasties, bookends, clocks and carved words. I design and make sterling silver and Welsh slate pendants and earrings. All of which can be personalised for a special present, anniversary, birthday, wedding, births and christenings or just to treat you. I am proud to say that all my sculptures, jewellery and cast creations are made by me to a very high standard. I also stock high grade hessian shopping bags and notebooks with paper made from crushed stone. I also organise The Gloucester Stone Carving Festival visit www.stonecarvingfestival.co.uk for updates and information. The next one will take place over the August bank Holiday weekend 2018. Please have a read through my blog which details my ideas and processes. I would love it if you leave feedback on any one of my posts that interests you. My workshop is at Taurus Crafts in Lydney. Hopefully my gallery will give you some ideas as to the range of my stone carving ability.